They don’t happen as often as they used to, but when the do, they take up a fair amount of my day and usually end in disappointment. I’m talking, of course, about AFCs — American Food Cravings. This particular craving happened as I was returning home on the train this morning. The lunch hour was approaching and as I began pondering when I might have for my noon meal, it came—as they always do—unbidden and unexpected: I wanted a Reuben Sandwich. For those of you not in the know, a Reuben consists of corned beef, Swiss chess and sauerkraut, smothered in Russian dressing, on rye bread, toasted on a griddle. And so, with the dread I usually feel when I attempt to cobble together an American delicacy, I left the train station and headed to Sainsbuy’s to see if I could find the ingredients. Corned beef was easy. They had slices in the deli section — £2.50 for three slices!! — and, fortunately, cans of it in the tinned meat section for (for appreciably less). 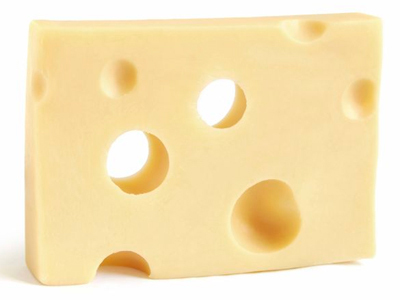 Swiss cheese was less straight-forward. There was none. But then I have never seen Swiss cheese in Britain, and there were several cheeses available with holes in them (which, to my mind, is the only distinction between Swiss cheese and other varieties) so I began to wonder if “Swiss” was an Americanism. I did some quick research on my smart phone and, sure enough, discovered that “Swiss cheese is a generic name in North America for several related varieties of cheese, mainly of North American manufacture.” Wikipedia also helpfully pointed out that the UK Emmental is a close approximation. I then discovered I was unable to buy a small jar of sauerkraut. So I bought a large one. And so, armed with a substitute cheese, Thousand Island dressing and enough sauerkraut to last me into the next millennium (aside from a Reuben Sandwich, what else do you use sauerkraut for?) I set off in search of rye bread. I knew this was going to be the tough one, as I noticed the absence of rye bread some time ago. When I was a lad, rye bread was like the Apple Computer of sandwich foundations. The default setting for a sandwich was plain, white bread. But sometimes we’d get the readily available rye variety. It was totally incompatible with normal bread—it wasn’t square, more of a large, flattened oval that didn’t fit in the toaster, and it was of a foreign texture, more substantial, darker and with an exotic flavor (well, to someone used to Wonder Bread). It made a good ham and cheese sandwich but, to carry the Apple analogy further, it was not as versatile as white bread. For example, you could not make a PB&J with it (that’s a peanut butter and jelly sandwich, for you Brits) and the idea of Fluff and rye bread didn’t bear thinking about. I had, however, an ace in the hole. Thanks to the unrelenting influx of east Europeans taking jobs away from native Brits (thank you, Daily Mail) we have our own east European market nearby. So with hope in my heart, I went there. They had rye bread, but not as I knew it. This loaf was smaller and more square but, as it was my only option, I thought I could improvise. With all the ingredients safely back at my flat, I started the process by opening the can of corned beef. It was one of those cans with the key and, as usual, the key broke when I was half way around. With no way to open the can using the traditional method, I resorted to the can opener. It wasn’t pretty. After brushing the shredded paper and metal filings from the corned beef, I found I could not get it out of the can. So I had to open the other end, as well. And after brushing more shredded paper and metal filings from the corned beef, it popped out easily. After that, it was a doddle. 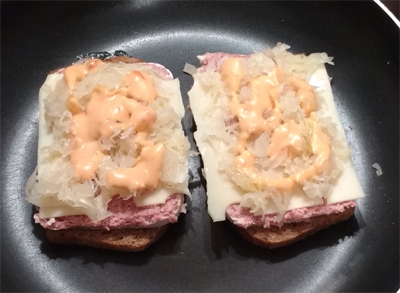 I buttered up four of the diminutive rye slices, put two in a frying pan and topped them with thin-sliced corned beef,emmental cheese, sauerkraut and Thousand Island dressing. They grilled up nicely, thank you very much. I was even able to flip them without much trouble and they tasted, not so bad. And the good thing is, I have plenty of ingredients to make more. What else would you use sauerkraut for? - Threaten misbehaving pets with certain doom. Well, I don't have any pets to threaten, but the other suggestions sound good. Thanks! I bet you didn't know that injuries from those key can openers used to be the biggest reason for trips to A&E. Too many people just pulling on the metal when the key snapped off. Ouch! I did not know that, but it does not surprise me. Those things are lethal. Mike, Emmental and Gruyère, both cheeses actually made in Switzerland, have been readily available in England all the time I've been alive. Both are stocked by your local Waitrose and Tesco (I've just checked for you) and probably other supermarkets in H.,and obviously in delis and specialist cheese shops.